Experience the iconic city of Cape Town, visit the vineyards of the Franschhoek wine region, tour the Garden Route and spend four nights at Jock Safari Lodge under a canopy of African skies expecting to observe the Big Five on multiple occasions on this Escorted Tour. PerryGolf is thrilled to present this fully managed, fixed itinerary of 14 nights with 5 rounds featuring South Africa’s No. 1 course, Fancourt - The Links, Pearl Valley, Steenberg and Pinnacle Point. ... Read More. We begin the journey in Cape Town at the famous Victoria and Alfred Waterfront, a bustling entertainment precinct but also a working port. Our base is Table Bay Hotel, a 5-star hotel ideal for easy explorations of the waterfront and surrounds. Each “Table Mountain” room offers a postcard view across the city with Table Mountain as the backdrop. We explore the city and its nearly four-century deep history as well as its many stunning natural sights. We will enjoy our first round at Steenberg Country Club, a modern course built around the edges of one of the oldest wine farms in the country. Following a short drive to Stellenbosch, we’ll play Pearl Valley, a Jack Nicklaus Signature course, featuring wide fairways guarded by abundant water hazards and bunkers. The course and its geographical location enables guests to enjoy a day outing in the Winelands with high quality golf to compliment the food and wine. Next we take a scenic drive across the Boland Mountains, arriving in the Cape Winelands where we will taste the excellent wines produced throughout the region, embarking on a cellar tour and two wine tastings. The flight to Fancourt is included in our itinerary and our accommodations there are the luxurious Manor House, located in the heart of the Garden Route for easy access to all area attractions. Guests are pampered by personalized butler service at Manor House, where 19th century charm meets modern day indulgences. On a day of sightseeing in Knysna Elephant Park observe relocated jumbo families and also enjoy the Monkeyland primate sanctuary. The privately owned Featherbed Natural Reserve offers the best flora and fauna representative of the nation. The golf courses in this region of South Africa are stunning and diverse. Fancourt - The Links was created on flat land where almost a million cubic yards of earth were moved to transform it into a links style layout. The Links has played host to the 2003 Presidents Cup, 2005 Women's World Cup and 2006 South African Open. Pinnacle Point is a majestic course set atop staggering cliffs, rivaling Cabot Cliffs and Cape Kidnappers for the best panoramic views in golf, offering risk / reward opportunities throughout. The Montagu Course at Fancourt was designed by Gary Player and remodeled in 2004 by David McLay Kidd (Bandon Dunes, The Castle Course St Andrews). The Montagu is South Africa's #6 and its best parkland golf course. After our flights from George to Skukusa we arrive at our final stop, Jock Safari Lodge, in time for an afternoon game drive. Jock is the first private lodge set in the heart of Africa’s premier wildlife reserve, the Kruger National Park, and we’ll enjoy four nights here. Each of the luxury air conditioned suites offers guests the unique opportunity to experience the gracious style of old world elegance surrounded by unspoiled wilderness. 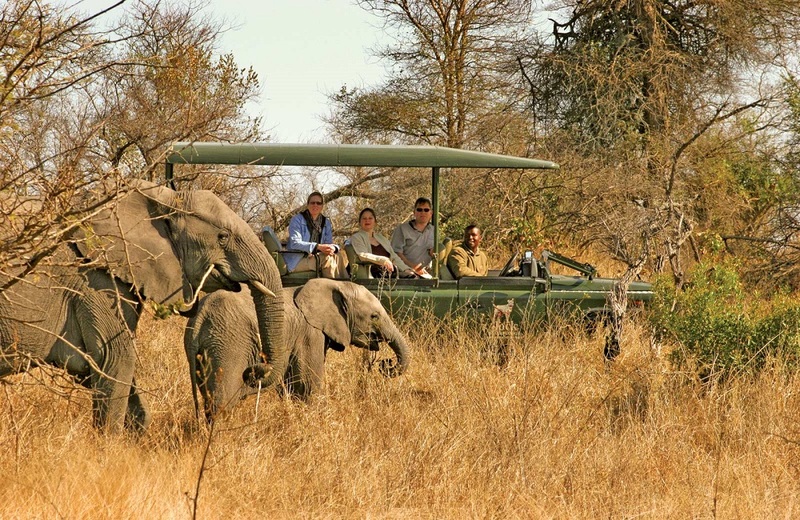 Expect to see leopard, lion, elephant and rhino from the comfort of your room or while enjoying seven game drives over the next four days, morning and evening, with ample time included to relax or enjoy a meal served in the bush or under the stars. Your stay at Jock includes all meals and snacks along with drinks on your safari drives. If you enjoy combining your love of golf with a passion for travel, you’ll find a relaxing and highly rewarding experience on this Escorted Tour for a party of 24-30. Every aspect is fully managed from the handling of your luggage and equipment to hotel and golf course check ins. Various meals, guided sightseeing, carts / caddies, local taxes, service charges and gratuities (excluding caddies) are included in addition to sandwiches, snacks plus an open bar for beer and wine during our time at each of the golf courses. Best of all, this PerryGolf vacation promises an ideal opportunity to join a group of like-minded new friends. On arrival to Cape Town, you will be met by our VIP staff at the door of your plane. 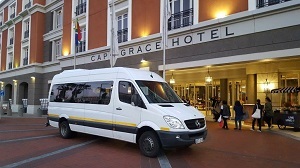 They will walk you through the VIP channel at immigration and to your transfer to the exceptional Cape Grace Hotel on the historic Victoria & Alfred Waterfront. Welcome Dinner for the group at the Cape Grace – including wine. Sightseeing Inclusion – Cape Town. Depart the city for the Lower Cableway Station to board the revolving cable car for a 5-minute ride to the top of Table Mountain. Nearly 3,400 ft above sea level, it affords birds-eye views of both the city and Peninsula as you walk its summit. Return to the city via the old Cape Malay Quarter for a walk through the Company Gardens, a park and heritage site originally created in the 1650s by the region's first European settlers. Today it is home to the SA Museum, Cultural History Museum, Houses of Parliament, National Gallery and St George’s Cathedral. Drive to the Castle of Good Hope, the oldest building in South Africa with its collection of Old Cape paintings and take in the Grand Parade where Nelson Mandela addressed the nation on his release in 1990. At the District Six Museum you’ll see a moving collection of stories, pictures and memorabilia highlighting the colorful life of this suburb which now stands empty, thanks to the destruction of homes and forced removal of residents during the height of the Apartheid era. Sightseeing Suggestion – The Victoria & Alfred Waterfront. Situated between Robben Island and Table Mountain in the heart of Cape Town's working harbor, The Waterfront has become South Africa's most visited destination. Set against a backdrop of magnificent sea and mountain views, exciting shopping and entertainment venues are intermingled with imaginative office locations, world-class hotels and luxury apartments in the residential marina. Play today at Steenberg, an 18 hole championship course designed by Peter Matkovich. A backdrop of vineyards, gardens, forests and mountains provides the setting for this beautiful and exclusive course. The course is always in excellent condition with bent grass greens and lush fairways. Steenberg offers you the opportunity of excellent golf within the historic setting of one of the Cape's oldest wine farms. Dating back to 1682 the vineyards have been replanted and 140 acres are now under vines. Enjoy Tapas after golf at BISTO 1682 found in the Steenberg Winery. Sightseeing Inclusion – Cape Peninsula Tour. Depart the city along the spectacular Atlantic Seaboard en route to the fishing village of Hout Bay where (as an optional extra) take a half-hour cruise to see Cape Fur Seals, or explore the harbour, visiting its fish markets and shops. Continue over the 1,200 ft heights of Chapman’s Peak Drive, one of the world’s most breath-taking passes and past the Cape’s longest beach where Southern Right Whales can be spotted offshore from June to November. Our visit to the Cape of Good Hope National Park includes a walk (or optional funicular ride) up to the Cape Point Lighthouse to take in magical ocean vistas at this, the south westernmost point of Africa. Next we’ll head along the False Bay coast to Boulders Beach near Simonstown to see a colony of African Penguins and then continue past the seaside resorts of False Bay towards the city. The last stop of the day is Kirstenbosch Botanical Gardens for a walk through one of the largest collections of indigenous plants in the world. Tour Highlights include: Hout Bay Harbour * Chapman's Peak Drive * Cape of Good Hope National Park and Cape Point * Visit to Penguins at Boulders Beach * Kirstenbosch Botanical Gardens * All admission fees are included as is lunch. Final tour cocktails and dinner this evening at The Cape Grace Hotel. Today play Pearl Valley. Set in the famous Franschhoek Wine region, this Jack Nicklaus Signature Course is consistently one of the top conditioned courses in South Africa. As with many Nicklaus courses, water on the right with plenty of sand will keep the golfers mind off the wide landing areas provided. Also a new development, the course and its geographical location allow for guests to enjoy a day in the Winelands with high quality golf to compliment the food and wine. Cart included. Dinner at Lanzerac in the Governors Hall – including wine. OVERNIGHT: Lanzerac Hotel. Classic Room with breakfast included. Sightseeing Inclusion – Cape Winelands. Depart the city for a scenic drive towards the Boland Mountains and Cape Wine Country. Here, we’ll visit our first vineyard for a cellar tour and a chance to taste some of the exceptional wines of this world famous wine region. Continue to Stellenbosch, South Africa's second oldest town, with its classic 17-18th Century Cape Dutch architecture set amidst oak-lined avenues, and pause a while to browse this beautiful university town. Proceed to Boschendal Wine Estate visiting its impressively restored manor house, en route to Franschhoek, where French Huguenots settled in 1688. Explore the town's shops and galleries before returning to Cape Town via Paarl, birthplace of the Afrikaans language. Tour Highlights include: Cellar tour * Wine Tasting (at least 2 wineries) * Stellenbosch, town of oaks * Boschendal historic manor house * Franschhoek Valley * Paarl. A lunch stop will be made en route and is included in the cost. This morning fly to George. Luggage will travel by road. Today play The Montagu Course at Fancourt. Designed by Gary Player and remodeled in 2004 by David McLay Kidd (Bandon Dunes, The Castle Course St Andrews), The Montagu is South Africa's #6 and its best parkland golf course. With the highest levels of conditioning and true championship layout, The Montagu at Fancourt sets the standards by which all other courses in South Africa are measured. Carts are included along with 1 caddie per cart. Today play Fancourt - The Links in the morning. Created on a flat piece of land, South African’s #1 had over 700,000 cubic metres of earth moved to transform it into a links style layout. The course presents undulating terrain and a dunescape that is the only such course in South Africa. Every hole has received detailed attention to ensure that the overall balance in terms of length, position of hazards and shot values are in harmony. As a result, The Links presents a solid test for every club in your bag. The Links has hosted the 2003 Presidents Cup, 2005 Women's World Cup and 2006 South African Open. The Links is walking only and the cost of a caddie is included. If you wish to add an extra tip for an outstanding experience, please feel free to do so in cash directly. Dining Suggestion – Serendipity. Here you will find a five-course table d'hote menu designed by award-winning chef Lizelle Stolze along with her husband Rudolf’s wine cellar, one of most impressive in South African. The restaurant is situated on the Touw River Lagoon adjacent to the Wilderness National Park just 20 minutes from Fancourt. Your butler will be pleased to arrange you reservation. Today is for touring the Garden Route. We will depart Fancourt at 9:30AM and drive along the coast to Knysna who’s most famed attraction is the Knysna Heads, the treacherous entry into the lagoon where many an ancient sailing vessel met its doom. Today on the Western Head is the privately owned Featherbed Nature Reserve dedicated to preserving the richness of local fauna and flora. Visitors are permitted only in the presence of one of the reserve's guides. We will visit the Knysna Elephant Park which is home to relocated jumbo families, while the Monkeyland primate sanctuary nearby does the same for tree-loving species. A dolphin-spotting boat tour can be arranged to include a stop at the Robberg Peninsula near Plettenberg Bay to visit a noisy seal colony. Additional golf can be arranged at Fancourt, George or Oubaai depending on availability. Relax this morning before departing Fancourt at 10.15AM for the 45 minute drive to the Indian Ocean where you will play Pinnacle Point at noon. Pinnacle Point is spectacularly perched atop staggering cliffs. It ranks comfortably among the Old Heads, Cape Kidnappers and Cabot Cliffs of the golf world for astounding places to build a golf course. Six of the holes play across deep chasms to greens that seem to float in the ocean. The yawning ravines and distant horizons can make 150-yard shots look like twice that length. On the par-four eighth, tee and green sit on opposing bluffs; big hitters can attempt an all-or-nothing carry with the hope of having an easy wedge in, or play it safe by bailing out left and facing a much longer approach. Cart included. This morning we will fly from George to Johannesburg and from Johannesburg to Skukuza. Transfer to Jock Safari Lodge in Kruger National Park (45 min). On arrival to Kruger, you will be met by Jock Safari Lodge Transport and driven to the lodge. Jock is located in the heart of Southern Kruger, one of the finest game viewing regions in all of Africa. Big Five sightings are routine, with the area being particularly good for leopard, lion, elephant and rhino. The afternoon safari activities start at 4PM and dinner is served at 8PM. Your stay at Jock includes all meals, snacks along with drinks on your safari drives. Drinks in camp are billed to your room. Enjoy a second full day on safari at Jock Lodge. Depending on the wildlife, weather and fitness of the group, a walking safari is possible. This is reviewed on the day. Enjoy a third full day on safari at Jock Lodge. Return to Johannesburg for departing flights. Depart from SKUKUZA or continue on with our Victoria Falls extension. The group has 2 x 16 seat Mercedes vehicles. These smaller vehicles allow us access to experiences that large coaches cannot. On the touring days, each vehicle will have a driver plus a guide allowing hop-on hop-off touring and easy travel. Open 4x4 vehicles operated by Jock’s professional team of safari rangers.